Delicious eggplant slices layered with a savory tomato sauce and baked in a cheese sauce made with Feta cheese. This casserole can be assembled ahead and refrigerated. Note: You will need to chill the assembled casserole in the refrigerator for at least an hour for the ingredients to set before baking so please allow for the extra time. Preheat the oven to 400 degrees. Lightly grease two sheet pans and bake the eggplant slices for 20-30 minutes or until tender, but not mushy. Set aside. Over medium high heat, heat the olive oil in a large sauté pan. Sauté the onions until translucent, about 5 minutes. Add the garlic and sauté until fragrant, about one minute. Add the tomatoes and simmer uncovered for about 10 minutes so that some of the liquid can evaporate. Stir in the chopped basil and mint and season with salt and pepper. In a medium bowl, beat the eggs with a whisk. Add the yogurt, milk, salt and pepper to taste and mix well. Set aside. In another bowl, combine the crumbled feta with the Anthotiro or Ricotta and set aside. Lightly grease a large round (12 -14 inch) or deep rectangular 9x12 pan. Sprinkle the bottom with a some breadcrumbs to absorb excess liquid. Place a layer of eggplant on the bottom. Sprinkle half of the feta cheese mixture, add 1/3 of the tomato sauce and half of the egg-yogurt mixture. Add another layer of eggplant, sprinkle the remaining feta cheese, add remaining egg-yogurt mixture and add another 1/3 of the tomato sauce. 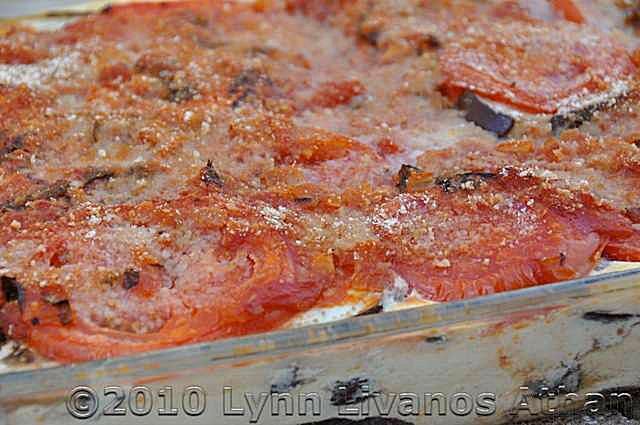 Finish with a final layer of eggplant mixed with tomato slices. Season with salt and pepper and top with the remaining tomato sauce. Sprinkle the top with breadcrumbs. Chill the assembled dish in the refrigerator for at least an hour. Bake in a preheated 350-degree oven for 45 minutes to an hour or until the dish is heated through and the cheese bubbles at the edges. Allow to cool before serving.